3. Robert T. HANKINSON (Reuben1) was born 29 January 1788 in Sissiboo, Annapolis County, Nova Scotia. (Haggan, Ida Louise; "The Haggan Papers (part 3)"; St. Thomas, Elgin County Library, 1978; page 45; originally printed in 1978) He died 08 December 1865 in Weymouth, Digby County, Nova Scotia. 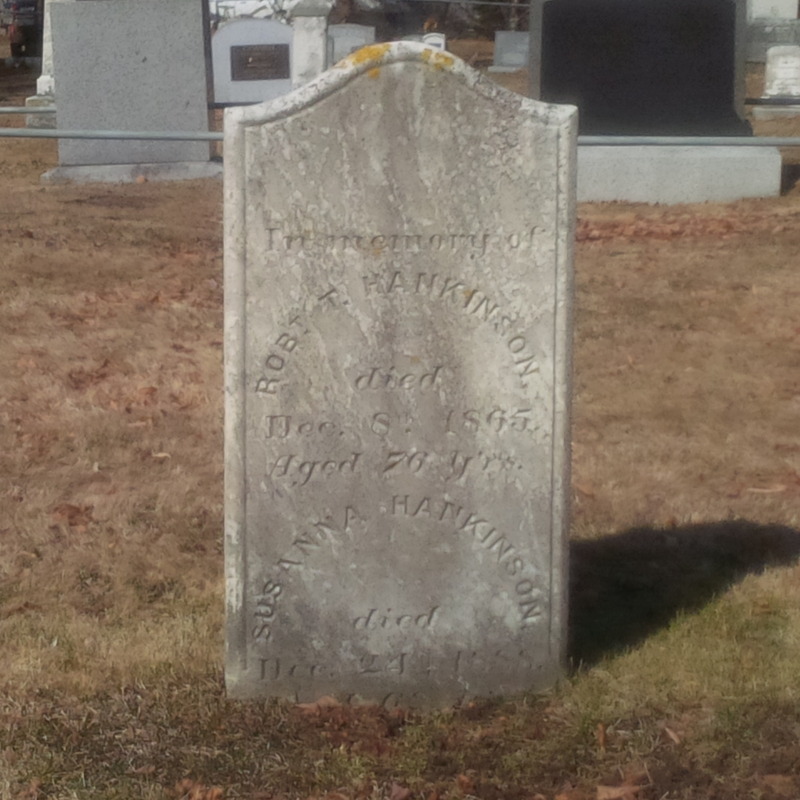 (Robert T. Hankinson tombstone; St. Peter's Cemetery, Weymouth North, Digby County, Nova Scotia) He married Elizabeth McCONNELL, the youngest daughter of Benjamin and Elizabeth (HAINES) McCONNELL, 16 January 1809 in Sissiboo. (Haggan, Ida Louise; "The Haggan Papers (part 4a)"; St. Thomas, Elgin County Library, 1978; page 33; originally printed in 1978) She was born 04 April 1790 in Sissiboo, (ibid.) and died 17 March 1851 in Weymouth from Cerebral Palsy. (The Christian Messenger; 11 April 1851, Volume XI, Number 15, Page 115; PANS MFM# 8352) Robert and Elizabeth are both buried in the St. Peter's Anglican Church Cemetery. At Weymouth, of Palsy, on the 17th ult., Elizabeth, the beloved wife of Robert HANKINSON, Esq., in the 61st year of her age, leaving a husband, eleven children, and a large circle of friends to morn her death. 4. 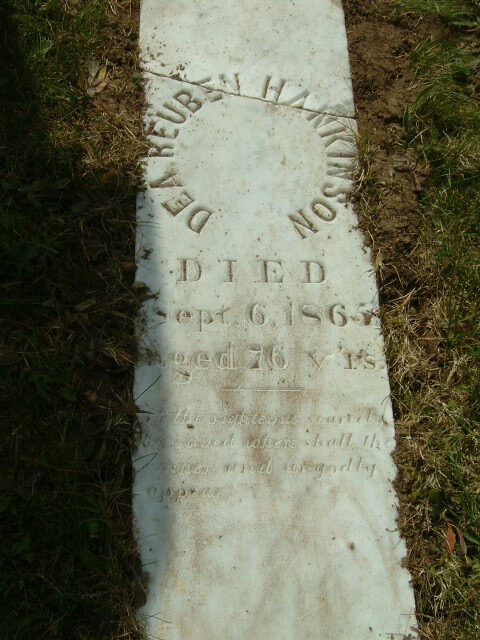 Deacon Reuben HANKINSON, Jr. (Reuben1) was born 27 December 1789 in Sissiboo, Annapolis County, Nova Scotia (Rheuben Hankinson tombstone; Riverside Baptist Church Cemetery, Weymouth North, Digby County, Nova Scotia) and died 06 September 1865 in Weymouth, Digby County, Nova Scotia. (ibid.) He married Christina SHOOK, the daughter of Deacon David and Eleanor (Van KLEEK) SHOOK, 1814 in Sissiboo. (Haggan, Ida Louise; "The Haggan Papers (part 4a)"; St. Thomas, Elgin County Library, 1978; pages 34; originally printed in 1978) Christina was born 09 January 1794 in Sissiboo, (Haggan, Ida Louise; "The Haggan Papers (part 4a)"; St. Thomas, Elgin County Library, 1978; page 26; originally printed in 1978) and died sometime during October 1830 in Sissiboo. (Haggan, Ida Louise; "The Haggan Papers (part 4a)"; St. Thomas, Elgin County Library, 1978; page 35; originally printed in 1978) Reuben remarried sometime between 1831-1835 to Charity GRANT, a daughter of David and Isabella (CHARLTON) GRANT. She was born on 07 December 1807 in Wilmot, Annapolis County, Nova Scotia and died 23 April 1879 in Weymouth. 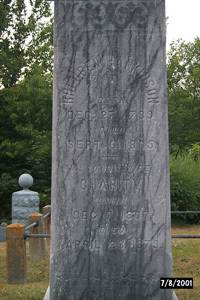 (Rheuben Hankinson tombstone; Riverside Baptist Church Cemetery, Weymouth North, Digby County, Nova Scotia) Charity GRANT's first marriage was to Daniel Webster NEWCOMBE, they had six children: Guy (born: 1820), Sabina Ruth (born: 1821), Joseph (born: 1823), Grant (born: 1828), Charlton (born: 1830), and Daniel Webster (born: 1831). 5. 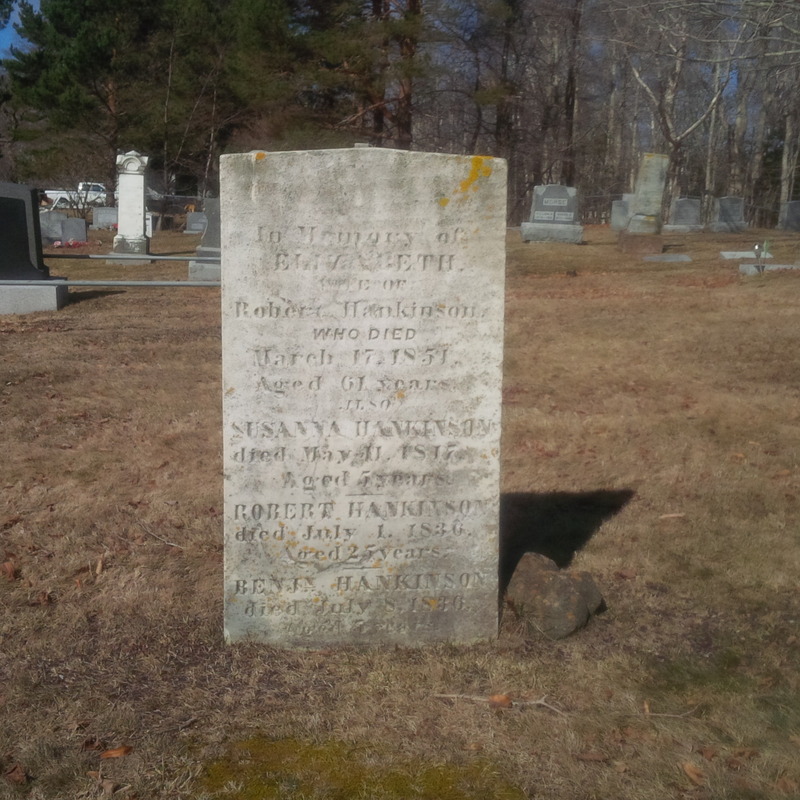 Sarah HANKINSON (Reuben1) was born 23 May 1791 in Sissiboo, Annapolis County, Nova Scotia and died 14 April 1876 in New Tusket, Digby County, Nova Scotia. (Morris, Gordon Alan. William Sabin and his descendants (1609-2000). Sentinel Printing Ltd., Yarmouth, Nova Scotia, Canada. 2000. Pages 157-158) She married William Brown McCONNELL, son of Benjamin and Elizabeth (HAINES) McCONNELL, circa 1817 in Sissiboo. He was born 13 February 1795 in Sissiboo, and drowned in March 1819 while constructing a dam on the Sissiboo River. (ibid.) She married a second time to Deacon Henry "Charlton" SABEAN, son of Benjamin and Elizabeth (CHARLTON) SABEAN, circa 1824. (ibid.) He was born 29 February 1796 in Sissiboo and died 14 January 1878 in New Tusket. [vii] (ibid.) Henry was first married to Jane PRIME circa 1822 and died circa 1823. Together they had one child: George Prime SABEAN who was born circa 1823. 6. Daniel LeRoy HANKINSON (Reuben1) was born 20 December 1792 on board a ship in American waters (Haggan, Ida Louise; "The Haggan Papers (part 3)"; St. Thomas, Elgin County Library, 1978; page 45; originally printed in 1978) and died sometime between 1880-1890 in Minneapolis, Hennepin County, Minnesota. He married Sarah Stanley ANDERSON circa 1822 in Middlesex County, Ontario. She was born circa 1804 in New Brunswick (1850 United States Federal Census of Grand Rapids, Kent County, Michigan) and died sometime during 1872 at Minneapolis. Daniel was the second of the family to leave Sissiboo. By 1822 he had moved to Middlesex County, Ontario (probably near London) and had married his wife, Sarah. Sixteen years later (circa 1838), about the time when his siblings were settling in Ontario, he moved to Grand Rapids, Kent County, Michigan.deaths. [ix] (Haggan, Ida Louise; "The Haggan Papers (part 3)"; St. Thomas, Elgin County Library, 1978; page 45; originally printed in 1978) After remaining there for nearly 30 years, circa 1866 he decided to move to Minneapolis. [x] (ibid.) He remained there until his death. He was a farmer by trade. 9. Catherine HANKINSON (Reuben1) was born 14 October 1798 in Sissiboo, Annapolis County, Nova Scotia and died young (Haggan, Ida Louise; "The Haggan Papers (part 3)"; St. Thomas, Elgin County Library, 1978; page 46; originally printed in 1978) probably in Sissiboo. After his father's death, he became his mother's "principal support". (Land Petition dated 1825 from John T. HANKINSON, PANS MFM# 15739, Land Papers (volume 92-93), Series A) On 05 September 1825 he petitioned for 200 acres of wilderness lands on the rear of the first division of lots on the new Yarmouth road and was later awarded his petition. (ibid.) On 08 August 1835, his mother sold the family homestead (Land Deed dated 08 August 1834 between Gitty HANKINSON and Thomas TOOKER, PANS MFM# 17701, Digby County, Weymouth Deeds (volume 12), page 182-183) and most likely, shortly after moved to Malahide along with her sons: John Taylor and Kenneth HANKINSON. [xvii] The location of his tombstone is unknown but he's probably buried near his mother's site in the Hankinson Cemetery in Malahide (see Deacon Kenneth HANKINSON's sketch for more information regarding the Hankinson Cemetery). 12. Ann HANKINSON (Reuben1) was born 07 July 1804 in Sissiboo, Annapolis County, Nova Scotia (Haggan, Ida Louise; "The Haggan Papers (part 4a)"; St. Thomas, Elgin County Library, 1978; page 37; originally printed in 1978) and died sometime during 1884 in Weymouth. (ibid.) Her first marriage was to Peter SAXTON, son of George and Rachael (MULLEN) SAXTON. (ibid.) He was born in 1803 in Sissiboo and froze to death in 1832 in Weymouth. (ibid.) She then married a Mr. POWELL, and a third time to Henry VROOM. In the mid 1830's to late 1840's, severe epidemics of diphtheria, cholera, typhoid, and tuberculosis swept through the country. Three of his daughters died within a three month span from diphtheria. (Haggan, Ida Louise; "The Haggan Papers (part 3)"; St. Thomas, Elgin County Library, 1978; page 45; originally printed in 1978) Kenneth buried them on his farm and thus had started the Hankinson Cemetery which, today, is incorporated as the Berean Baptist Cemetery. 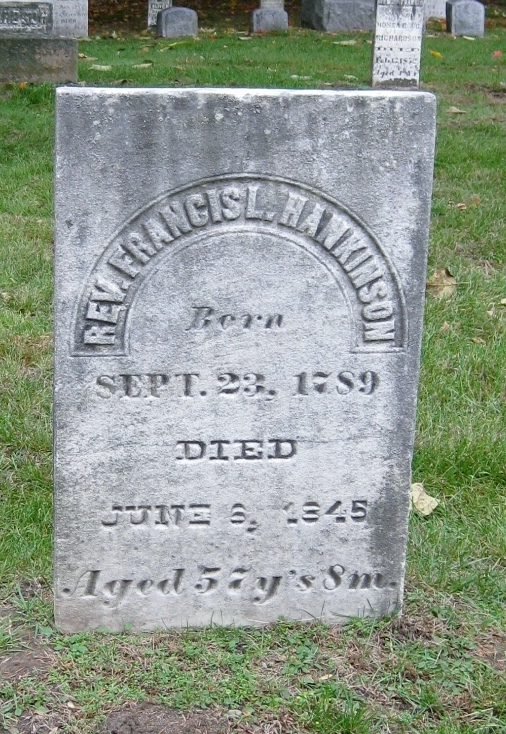 [i] Reverend Francis HANKINSON's gravestone at the Mount Avon Cemetery in Rochester, Oakland County, Michigan indicates that he was born 23 September 1789 and died 06 June 1845 at the age of 57 years, and 8 months. If he was 57 years, and 8 months on 06 June 1845, he should have been born about October 1787 and not 23 September 1789. A census taken 12 March 1787 of Sissiboo (Brudenell, Edward Letter Book, PANS MFM# 10109-X, page 253) shows Reuben HANKINSON married and with one child. Assuming Francis was Reuben's first born, Francis would have to have been born before March 1787. From the information found on the 1810-1840 US censuses, we can deduce that he was born between 1785-1790. In regards to his actual birth date, "The Haggan Papers (Part 3)" by Ida Haggan suggests a date of 22 November 1786, which sounds very probable. [ii] The 1840 United States Federal Census of Avon, Oakland County, Michigan shows Levi LeROY (family of six and uncle to Francis LeRoy HANKINSON), Horace FOOT (family of five and brother-in-law to Francis LeRoy HANKINSON), Francis LeRoy HANKINSON (family of eight and himself), Reuben HANKINSON (family of three and son to Francis LeRoy HANKINSON), and Peter Francis LeROY (family of five and cousin to Francis LeRoy HANKINSON), all living near each other. [iii] He was probably living on his mother-in-law's estate by 1827 because the 1827 Clare Township Census didn't enumerate him as a resident of that township during that time. [iv] It's interesting to note that Robert, his wife, his children, and possibly his father are the only Hankinsons buried in an Anglican Cemetery while his siblings and most of their descendents are all buried in a Baptist Cemetery. It's also interesting to note that in 1840 Robert very generously conveyed a parcel of his land, near Weymouth Bridge, to the Baptist Congregation of Weymouth. [v] The age printed in the Christian Messenger is inconsistent with his actual age. It should have been 75 years, not 70. [vi] There is an old family history that states that his first tombstone was thrown over the embankments at the Riverside Baptist church cemetery because it didn't display the name of his wife, Charity. It was quickly replaced with one baring her name. His original tombstone was found in 2005 by Julian David Hankinson while on vacation in Weymouth. The original reads as follows: "Dea Reuben HANKINSON. Died Sept 6, 1865. Aged 76 yrs.". [vii] Henry's first marriage was to Jane PRIME in 1822. They had one child together (George Prime SABEAN b: 1823). Sadly, Jane died shortly afterwards. [viii] The 1827 Clare Township Census lists no SABEAN family living in that township at that time (http://www.rootsweb.com/~nsdigby/census/1827/clareprs.htm). New Tusket is located within the Township of Clare which, in turn, is within Digby County. [ix] The 1850 Census of Grand Rapids, Kent County, Michigan shows Sarah being the last child born in Canada and Richard to be the first born in Michigan. Therefore, if Sarah was born in 1838 and Richard in 1841, the year in which Daniel moved to Grand Rapids would fall between those dates. [x] The 1860 Census of Paris, Kent County, Michigan and the 1870 Census of the First Ward, Minneapolis, Hennepin County, Minnesota identify's Daniel a resident. Therefore, he must have migrated from Michigan to Minnesota during that period. [xi] According to an online transcript of the Estherville Cemetery, Bayham Township, Elgin County, Ontario (http://www.elginogs.ca/cemeteries/bayham/estherville.htm), it shows that James Thomas H. HANKINSON died 26 November 1875 at the age of 79 years, 5 months, and 19 days. This would make his birth date 07 June 1796. It also indicates that Clarine, wife of Thos. HANKINSON, died 09 July 1862 at the age of 60 years, 10 months, and 15 days; making her birth date 24 August 1801. With the exception of Clarine's death date, both their birth and death dates correlate to the dates within "The Haggan Papers (part 3)" by Ida Louise Haggan. Regarding Clarine's death date, "The Haggan Papers" indicates that she died 02 July 1862, which would make her 60 years, 10 months, and 8 days which contradicts her tombstone. [xii] The 1827 Clare Census (available at http://www.rootsweb.com/~nsdigby/census/1827/clarehjklm.htm) shows Thomas as the only HANKINSON in the Township of Clare. His older brothers had previously and successfully obtained land in Weymouth and had both already relocated. Robert moved back before 1827 and Reuben in 1824. [xiii] For those who haven't been to Weymouth (nee Sissiboo), the quality of land is poor (filled with rocks, swamps, hills, etc...). For a family dependent on their land, this can make life a lot more difficult. With this in mind, a brother of Clarine, Alexander HAINES, set out in seek of better opportunities. Upon his return from the "Lake County" (Elgin County), he praised about its virgin lands to his family and friends. By early summer 1828, Thomas and his parents-in-law moved to Malahide. Within the next few years, three siblings and his mother followed. [xiv] Many Sissiboo families (HANKINSON, McCONNELL, SHOOK, HAINES, SAXTON, etc...) left their homes in Nova Scotia during the late 1820's and 1830's to settle in Elgin County. As such, a street was named "Nova Scotia Street" in their honour. [xv] Thomas had also received a piece of his father's property bordering the Sissiboo River about the time he was granted land in New Tusket. However, this land was smaller and of poor quality compared to the land in New Tusket. [xvi] The online transcripts of the Lakeview Cemetery, Malahide Township, Elgin County, Ontario (available at http://www.elginogs.ca/cemeteries/malahide/lakeview.htm) indicate that Richard HANKINSON died sometime during July 1830 at the age of 36 years. Firstly, his last child was born in 1833 disproving the fact that he died in 1830. Secondly, if he was born August 1801 and if he died at the age of 36, this would make his death taking place in July 1838. The author also posses a Hankinson Genealogy (which bares no author or published date) which gives his death date in July 1836. The author suggests the date of July 1836 because of the shorter gap between the last child born and his death date. The cemetery transcripts also indicate that Elizabeth, wife of Richard HANKINSON, died 29 November 1877 at the age of 76 years. [xvii] Gitty and John Taylor HANKINSON moved onto Richard HANKINSON's farm. They remained there and helped manage the farm. Kenneth HANKINSON bought a separate piece of land in Malahide and lived there. [xviii] The Bayham (Port Burwell) Baptist Church was established on 19 January 1819. In 1836, the congregation stood at 145 members and it was decided to construct a meeting house. On 20 August 1842, the membership stood at 209 and it was decided to create a new meeting house in Malahide. In 1849, the new church was opened and called the Jubilee Church of Malahide. In 1862, controversy over the appointment of a few Deacons within the Jubilee Church caused some members to withdrawal from the church and to form a new church. The Jubilee Church renamed to the Lakeview Church and the new church was to be called the Berean Church. The Berean Church was finally built in 1870 (for the sum of $900) on Deacon Kenneth HANKINSON's property (Lot #31, Concession #2). However, in 1894, the church was moved to Aylmer, Elgin County, Ontario.